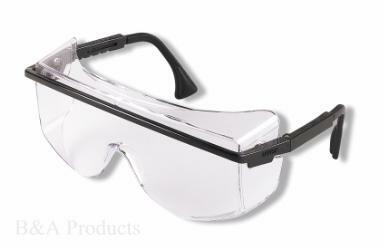 Protect your eyes from contamination by wearing protective eyewear. The polycarbonate lenses are anti-fog, anti-static, anti-scratch and protect against harmful UV rays. The model PM5300 and PM5900 are designed to allow them to be worn over prescription glasses. Standard stock color for the PM5300 is black. The PM5900 is clear poly one piece molded frame.